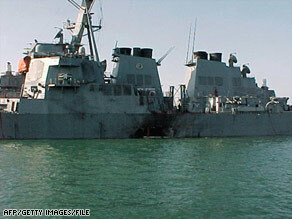 WASHINGTON (CNN) -- A military judge Thursday refused to delay proceedings against the accused mastermind of the bombing of the destroyer USS Cole despite President Obama's call for a temporary halt to trials of suspected terrorists. Obama ordered a 120-day delay of pending cases at the U.S. prison camp at Guantanamo Bay, Cuba, on his first day in office, requiring prosecutors to seek delays in the 14 active cases before military commissions there. But the judge, Col. James Pohl, refused the government's request for a delay and ordered arraignment for Abd al-Rahim al-Nashiri to go ahead as scheduled February 9. Obama's order to stay proceedings is meant to give his administration time to review cases before the much-criticized military commission process, which the Bush administration set up to try prisoners accused of taking part in terrorist attacks on Americans. White House spokesman Robert Gibbs said Thursday that Pohl's ruling won't affect the review. "We are consulting with the Pentagon and the Department of Justice to explore our options in that case," Gibbs said. The Office of Military Commissions, which manages the prosecutions, may have to temporarily drop charges against al-Nashiri to comply with the presidential order, said Cmdr. Jeffrey Gordon, a spokesman for that agency. Pentagon spokesman Geoff Morrell discounted that possibility but said that no proceedings against al-Nashiri would be going forward. "The bottom line is, we all work for the president of the United States in this chain of command," Morrell said. "And he has signed an executive order that has made it abundantly clear that until these reviews are done, all of this is on hiatus." Critics of the system have said that is one of the problems with the tribunals: that the courts are subject to the influence of officials up the chain of command. But al-Nashiri has said he was tortured into confessing involvement in the bombing. The CIA has admitted "waterboarding" him at a secret location in 2002, and tapes of the interrogation were destroyed in 2005. The United States accuses al-Nashiri of terrorism, murder, attempted murder and destruction of property, among other charges.